The hepatitis C test measures the HCV blood antibody levels. What is a hepatitis C test? A hepatitis C test checks for a prior or current hepatitis C infection by measuring hepatitis C antibody blood levels. Why is a hepatitis C test important? A hepatitis C infection can be easily spread to other people and can also cause destruction of the liver and other organs. This Hepatitis C Test is a blood test. The hepatitis C test, also known as the HCV test, anti-HCV test, hepatitis C blood test and a hep C lab test, checks for hepatitis C blood antibody levels. Hepatitis C is caused by an infection by the hepatitis C virus (HCV). Hepatitis C infections typically affect the liver, a major organ located in the upper right part of the abdomen. HCV is typically spread from blood contact with an infected individual through a contaminated blood transfusion, intravenous drug use, or a needlestick injury in a healthcare worker but it can also be spread via sexual contact. After an infection, many people will have no symptoms. If the hepatitis C virus spreads through the liver, symptoms may show up over time. Symptoms associated with a hepatitis C infection including persistent, worsening jaundice, abdominal pain and fever. In time, a chronic hepatitis C infection can lead to cirrhosis, liver failure, liver cancer and an increased risk of gastrointestinal bleeding. After an exposure, there is a delay from the time one is infected with hepatitis C and when the hep c antibodies actually show up on blood test results. In some cases, it may be as long as six months although it is typically shorter in most people. For this particular hepatitis C test, if the blood test comes back positive, or reactive, then the hepatitis C RNA test will automatically be run to confirm the lab result. People get the hepatitis C lab test for general screening, in the setting of an exposure or concerning symptoms, or for compliance requirements for work or school. When done for screening, especially for a new relationship, some people opt for the more comprehensive STD test panel. To get a hepatitis C test near you, order online and get your blood drawn at Quest Diagnostics. Once the HCV lab report is ready, it will be available for electronic download. 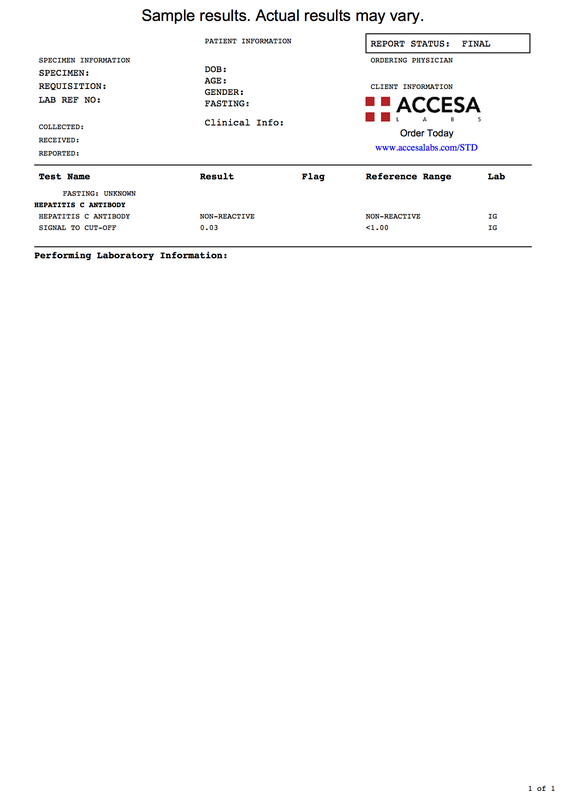 As can be seen on the sample hepatitis C lab report above, the hepatitis C antibody blood level will be reported as non-reactive if no HCV antibody is detected. A positive hepatitis C test suggests a prior or current hepatitis C virus infection. At this time, there is no vaccine for hepatitis C although chronic infections may be curable with antiviral medications. When advanced hepatitis C cannot be cured, then most people with hep C require a liver transplantation. In 2015, data suggests that approximately 143 million people worldwide were infected with Hepatitis C.
Hepatitis C Test at Guaranteed Prices.